What is Memoria Press’ position on the Common Core Standards? The recently finalized national academic standards, which include both the Common Core Standards and the Next Generation Science Standards, have become a heated topic of discussion among professional educators as well as homeschoolers. Memoria Press does not align its program with these standards for several reasons. The first is that they are not as academically rigorous as the implicit standards behind Memoria Press’ Classical Core Curriculum. The standards are designed with public schools in mind and because of this the new national standards betray a “least common denominator” approach. The Classical Core Curriculum does not take such an approach but emphasizes the highest standards of knowledge, skills, and understanding. The science standards, for example, do not pursue science study in high school beyond biology. Chemistry and physics are largely left out. The literature standards also require schools to reduce the amount of imaginary literature students read. The Classical Core Curriculum stresses both history and literature because this is the way students are familiarized with their culture and are taught what virtue is. The second reason Memoria Press does not follow the new national standards is because they have a political bent to them that we find disturbing. In the science standards, for example, climate science is emphasized way out of proportion to its true place in science. Mentions of climate science dwarf all other scientific topics. Finally, the national standards are strong on disconnected information, but weak on an integrated approach to thinking skills. The Common Core Standards have no provision for students to learn logic–nor do they contain any acknowledgement of the role the study of an inflected foreign language like Latin has in teaching students how to think in an organized and systematic way. The science standards have almost no mention of scientific reasoning and only mention the word “hypothesis” once. Classical Education not only teaches students the information they need in order to excel academically, but it also teaches them how think. Latin, traditional logic, and our other subjects give students the ability to think for themselves. The Common Core Standards talk about teaching students to think critically but give no means by which this goal can be achieved. The Common Core Standards and the Next Generation Science Standards are just the most recent attempt by the public school establishment to appear as if it is doing something that will improve schools. However there is no indication that this effort will produce results any different than those produced by the countless other high profile education reform attempts that have been made over the last 100 years. Is the entirety of the Memoria Press curriculum Christian? Yes! While you may think you are studying history, literature, or even penmanship, everything speaks of the glory of God. We aim to instill in the student an orientation towards Truth, Goodness, and Beauty—all of which we believe are found in their purest form in God himself. In some of our materials you will find explicit references to the faith and to Scripture. In some of them it is implicit. We do recognize the need for Christian educators in public settings to have curriculum that is full of Truth, Goodness, and Beauty but is not explicit in its Christianity. We have released a separate line of products to meet that need. What is the ideal Latin sequence? My student is in X grade. Should I use Latina Christiana or Prima Latina? Unless you have a strong background in Latin, we recommend that you start with Prima Latina for any students in 3rd Grade or younger. It is better for your students to be successful and love Latin than to be frustrated and discouraged. You should not start Latin until your student can read well (usually around second grade). If you feel uncomfortable about starting Latin or want a gentle approach, you may consider Prima Latina for students as old as 5th Grade. Is Prima Latina just a list of vocabulary words like many other beginner programs? No, Prima Latina is designed to tie into Latina Christiana. It teaches the English grammar foundation a student needs to be successful in Latin, while introducing basic Latin grammar concepts. The vocabulary in Prima Latina is a subset of the vocabulary in Latina Christiana. When your student starts Latina Christiana, he will have a certain amount of vocabulary review that allows him to focus on the new Latin grammar he is learning. 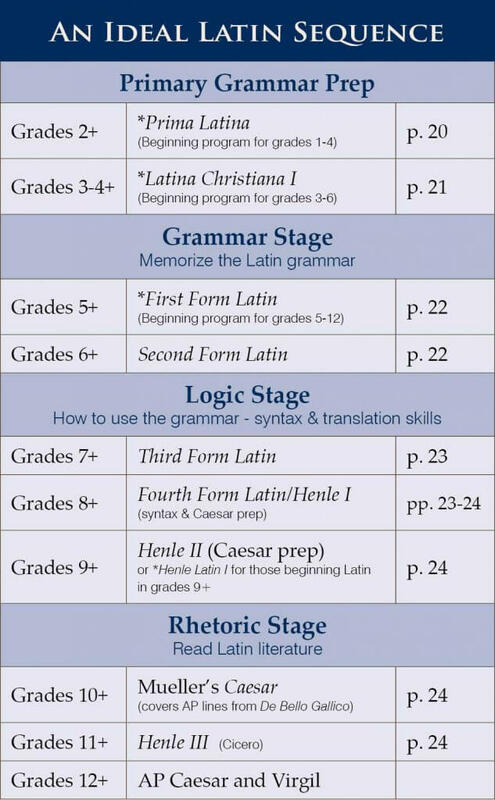 This method allows students to progress through into their study of Latin at an advanced pace. How long should it take me to complete Prima Latina? Prima Latina is designed for one year, however, you should progress at your student’s pace. Older students often finish it in a semester and younger ones may spend as much as two years on it. The goal is to study Latin for mastery and take your time. I have already started Latina Christiana with my 3rd grader. Should I switch to Prima Latina or stay with Latina Christiana? My student does not have a strong grasp of English Grammar yet. Prima Latina is designed exactly for your student. It focuses on teaching the arts of speech and grammar basics while introducing some Latin vocabulary, sayings, and prayers (which young students learn easily). Prima Latina will essentially replace your English grammar course. If you are not too far into Latina Christiana and have the time, you will be well served to switch. You can achieve similar results in Latina Christiana by patiently teaching the English grammar. If you use Latina Christiana, you won’t expect your student to understand the text’s grammar as quickly as he can move through the vocabulary, sayings, and prayers. Just move forward with his memorization and you can fill in his grammar understanding as you cover those concepts. Essentially, you will cover the book once for memorization and basics, then again for grammar and understanding. Can I use Classical Pronunciation with Latina Christiana instead of Christian pronunciation? Of course! You can choose any pronunciation you like in Latin. If you would like to use Classical Pronunciation, follow this link for our Classical Pronunciation Guide. Just print it out and use it instead of the Christian Pronunciation Guide in the book. (Note: The CD and DVDs use Christian Pronunciation.) The only time pronunciation really counts in Latin is for the songs and prayers. These should always use Christian Pronunciation, or they won’t sound right.